New Life was born through the love of the shabby chic style. It says comfortable like your favorite pair of jeans, worn yet a touch of elegance, stylish but mismatched works too, romantic, vintage but easy. Now we’re looking to YOU to display your shabby chic style. It can be a room in your house, or the soft pastel cottage garden outside or it can be that ‘go to’ vintage dress and hat thats always calling you to wear when you’re going out for a day of shopping or dancing. We’ll leave that up to you. Just show us in one photograph that screams ‘shabby chic.’ The content of the photograph will be judged – NOT the lay-out or presentation. You can ‘fancy’ up the photograph using Photoshop or Gimp, but that is not what it will be judged on. We are judging ONLY on your style inworld. 1) The photograph MUST have at least ONE object in it that was PURCHASED from one of the stores on New Life. *Object: prim or apparel* There are lots of unique stores to choose from. ***IF there is a photography studio/business on New Life you may use them to take your photograph and that can take the place of the one object/apparel. 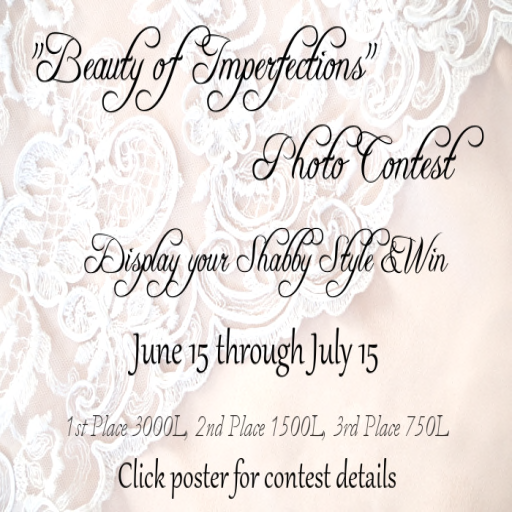 2) The photograph will be posted on the “Beauty of Imperfections” Contest Board at the following location. Instructions for placing photograph on the board will be given at the board location. 3) After dropping the photo on the board a notecard MUST be sent to Petunia908 Pinklady. 4) 3 business owners from New Life will judge the entrants and winners will be announced on July 16th. 5) Business owners on New Life are not eligible to enter the contest and PLEASE do not use your alts either! Get on over to New Life and join! Posted in Uncategorized and tagged as BeautyOfImperfectionsContest, NewLife, ShabbyChic.